Imagine the perfect Up North Getaway...a long stretch of sugar sand beach, amazing waterfront views, plus the many comforts of home, all just steps from downtown Traverse City. This easily describes the experience you’d enjoy at the Bayshore Resort. Of course, given the resort’s gracious amenities, you could excuse a guest for just staying put. 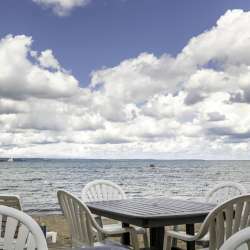 Bayshore Resort is one Traverse City’s larger properties, offering 120 rooms, many with beautiful views of the bay. 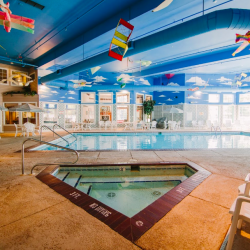 The resort has an indoor pool, hot tub, plus an all-inclusive fitness center. The resort also offers a large arcade, popular with many of the visiting families. Bayshore also partners with a local company to offer boats, jet skis, kayaks, and more for daily and weekly rental. Bayshore Resort also caters to the business crowd, with two meeting rooms that can accommodate groups up to 65 or 70. 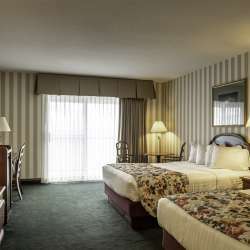 Bayshore’s location is also a boon for guests wanting to explore further. The area’s many wineries, on both peninsulas, are just a short drive away. Local microbreweries and distilleries, which continue to grow in popularity, are also close by. The area’s museums, galleries, and other points of interest are easy to reach too. Whether it’s summer, winter, or anywhere in between, Bayshore Resort is definitely close to perfect.